A radically novel breed of paper. Tree-free, bright white and stainproof, it allows artists to create shapes, patterns and nuances that are impossible to achieve on conventional papers. Non-absorbent and slick, a revelation for artisans. This is Yupo Heavy. A synthetic (polypropylene) substrate is born with a non-porous surface that repels water. 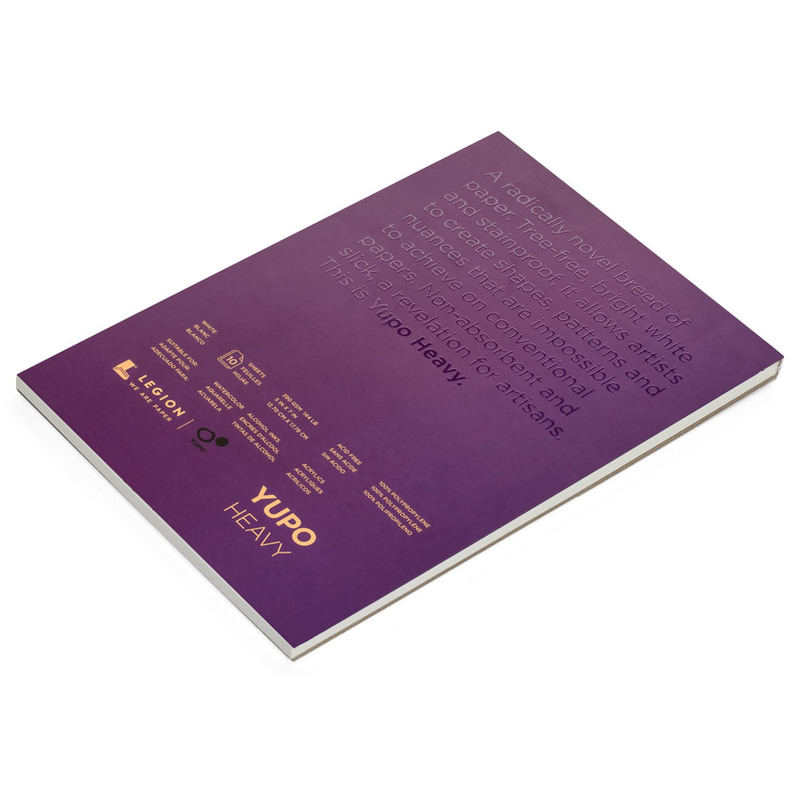 Yupo gives visual artists an amazingly beautiful canvas to work with. Its bright white, smooth finish gives artists the flexibility to work in several different mediums to achieve unique and creative results. Painting or drawing on the ultra-smooth surface of YUPO is different than regular watercolor or drawing paper, and will require some adjustments by the artist. The surface may be wiped clean to restore the original white of the sheet, making it an excellent surface for beginners. YUPO is also a very exciting substrate for more advanced and experimental artists. Its creative possibilities and suitable applications are infinite. Making paper is an art. We represent centuries of tradition and mastery in fine art papers. Since our 1994 inception, we have traveled the globe searching for the finest papers from the finest manufacturers. To date, we offer more than three thousand existing papers from sixteen countries but our quest continues. Collaborating with some of the most legendary artists and renowned mills, we are known as the world's most relentless innovator in the art of papermaking. We constantly aim to be ahead of the curve. We listen to your needs and seek out new ways for you to enhance your work. We add value to creative work. We put vision into paper. We are paper. Such a mission entails never ending travel. In the nineties, Michael and Len traveled to centuries-old German mills, visited legendary Italian manufacturers, Nepalese villages at the foot of the Himalayas, handmade paper makers in the Northern regions of Thailand and mills on Japanese islands. They weren’t just traveling to bring paper home, they wouldn’t only limit themselves to selling what the mills were offering. Instead, they wanted to know what the mill was capable of making. Could these machines and handmade paper craftsmen make what the fine art market wanted? This had been Ginsburg’s strategy from the start of his career. Since the early seventies, he has invested much of his time in listening to artists. He asked them: “What is your perfect paper? What does this ideal paper look like? What does it feel like? What color palette is desired?” With that information, Michael traveled to mills he knew had the capability of producing the best substrates. By trial and error, going back and forth between the mills and the artists, Ginsburg would come back with trials of paper his artists had asked for. Len, at the time Ginsburg’s competitor, was experimenting with new US-made 100% cotton papers for high-end fine art reproduction. So together, they set out to know exactly which mill was capable of making the papers they had in mind. This is still the method we use at Legion Paper. Half a century later, we still listen to the wishes of artists and seek out ways to make them come true. We don’t keep our expertise to ourselves. Get in touch with us. We love to share our passion for paper. For each specialty and exception, we are the solution. We're proud of our inventory of over three thousand papers. If we don't have what you need, we know where to find it. And if it doesn't exist, we will create it for you. That is what makes Legion the unique resource we are today. This studio workhorse provides a supple surface that's agreeable to myriad creative disciplines. Originally created for printmakers, this cotton paper soon spread across all drawing techniques, especially colored pencil. This is Stonehenge White. This paper has refined strong and versatile quality. With characteristics of warm tones and a smooth supple surface, it has traditional feel with the ability to apply multiple layers of color. This is Stonehenge Warm White. With five neutral colors to choose from, Natural, Fawn, Cream, Pearl Grey and Warm White, each sheet offers a new starting point for your work, while the surface is perfect for all drawing techniques. This is Stonehenge Colors. Inspired by the industrial look of paper grocery bags. Each earth-toned leaf provides a surface perfect for printmaking, drawing or experimentation. All-cotton and emanating Stonehenge archival virtues. This is Stonehenge Kraft. Hand-crafted with the watercolorist in mind, this rugged and textured substrate is our latest creation in artisan paper. Each coldpressed sheet naturally receives applied moisture, making it ideal for blending and lifting color. This is Stonehenge Aqua Coldpress. Smooth and silky. Water permeates this paper slowly, allowing time for fine details and subtle color gradations. Pigments tint bright and radiant. An innovative, custom-made paper to fulfill the needs of watercolor artists. This is Stonehenge Aqua Hotpress. The airy cousin to our classic white sheet. With a silky surface, it is perfect for the artist who prefers a more delicate sheet that can work with all fine drawing techniques. This is Stonehenge Light. Designed to withstand both delicate and bold impressions, this sturdy substrate was our first 100% cotton paper to be produced by an American mill. With a soft textured finish, it's the ideal surface for graphite, pastel, colored pencil and charcoal. This is Lenox. With a translucent finish, these slick sheets are an excellent beginning point for a variety of mediums. 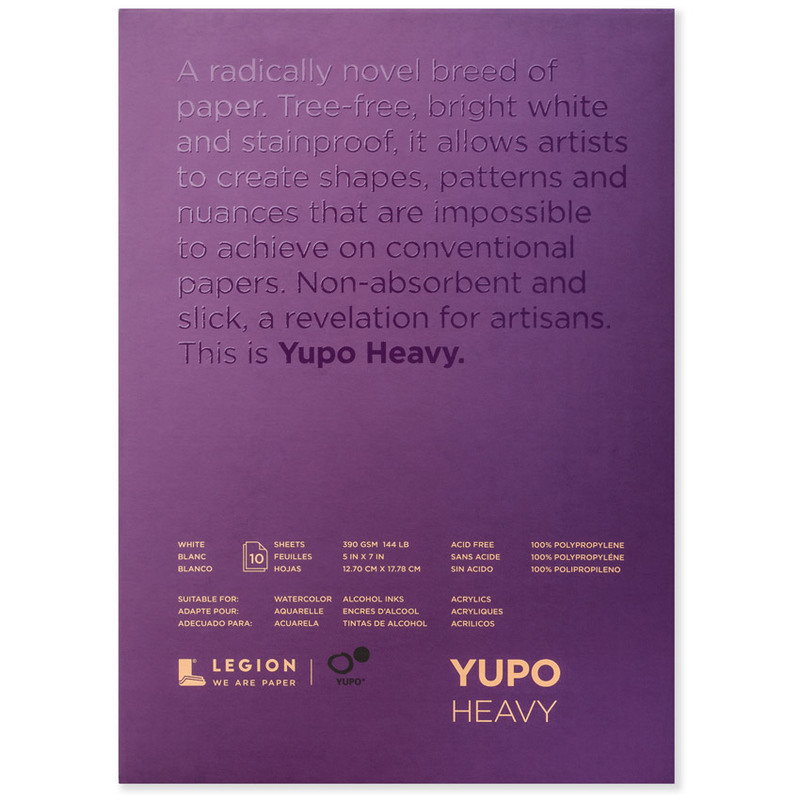 Remaining true to all Yupo revolutionary qualities, this substrate allows artists to rethink coloring from a fresh perspective. This is Yupo Translucent. A true innovation in fine art substrates. This synthetic, tree-free paper is everlasting and non-absorbent. It resists buckling with wet media and can be wiped clean. Pigments will retain true clarity and brightness. A new way for techniques to flourish. This is Yupo Medium. At Legion, our art is paper. And now we are proud to announce our new redesign, a bold disruptive look that takes three of our papers, new and old, and connects them so you know that you are getting the quality, consistency and substance you demand for your art. It was time to break tradition. To create something the market had never touched upon. The design-savvy covers strip away the clutter of conventional pad covers, using a varnish text against a solid background color to capture the attention of the artist without being intrusive. Designed for the artist’s eye, the clean, bold type tells you the paper, a beautiful gloss overlay paints an ephemeral verbal picture of exactly what that paper can do.